New York City is the midst of a housing affordability crisis. Over the last decade, average rents have climbed 15% while the income of renters has increased only 2%. The city’s renaissance since the 1990’s has drawn thousands of new residents; today, the population of 8.5 million people is the highest it has ever been. But New Yorkers are finding that the benefits of city living are not without its costs. The demand for housing has outstripped the real estate community’s ability to supply it; as a result, prices have been rising. Mayor Bill de Blasio, upon taking office in 2014, has made expanding affordable housing a key part of his policy agenda. The objective is to preserve or build 200,000 units for those in the lowest income brackets over the next 10 years. At the end of July, de Blasio announced that the plan was ahead of schedule, having supported the creation or preservation of 53,000 affordable apartments. The Wall Street Journal ran the glowing headline, “Affordable Housing Surges in New York City”. Unfortunately, de Blasio’s plan ignores the economic realities in favor of more politically palpable and piecemeal solutions. First is the increased reliance on the city’s rent stabilization program, and the second is tinkering with zoning rules to incentivize the construction of low income units in specific neighborhoods. His plan does little to promote housing affordability citywide, and, as long as the population keeps growing, rents will keep rising. Rent stabilization and the current zoning laws were enacted as post-World War II programs. They were responses to the problems that the city was facing in the middle of the 20th century. But over a half-century later, well into the 21st, the city is still relying on outdated policies because it is the path of least resistance for policy makers. But the future of New York and the affordability of its housing depends on resident’s willingness to rethink these policies and engage in a dialogue about broader plans to carry New York forward. As part of his plan, de Blasio has made deals with large landlords to keep their units rent stabilized for years to come. The rent stabilization program, dating from 1969, was an outgrowth of the city’s rent control program, which was an expedient enacted during World War II to address the city’s housing shortage. Today, about half of the city’s renters are in rent stabilized units, which offers two key benefits. First is that these apartments are not subject to market rate rent changes. Rather, each year, the Rent Guidelines Board meets and chooses the maximum rent increase that landlords can charge. For the past two years, the Board has prohibited landlords from raising their rents for one-year leases. Second is that renters have the statutory right to renew their leases; which means that only they, but not landlords, can decide when to terminate a lease. While rent stabilization is good for those who have it, it contributes to the affordability problem. By restricting prices in half in the rental market, it makes prices in the non-regulated sector higher than they would be otherwise, driving developers to focus on luxury highrises, at the expense of middle-income housing. Higher prices in the non-regulated sector makes a rent stabilized unit that much more of a better deal. This contributes to lower turnover in these units and essentially ensures that landlords will be unable to empty their building to tear them down to construct more housing in the city—housing that they would otherwise be happy to provide given the demand for it. This is one of the reasons that today, 75% of the city’s apartment buildings were built before 1932. The second problem with de Blasio’s plan is that it tinkers on the margins with the zoning rules. Today’s regulations were enacted in 1961, and were a major re-writing of the first set of zoning rules enacted 45 years previously, in 1916. The rules don’t limit building height per se, but rather limit a building’s bulk; each neighborhood is effectively placed under a kind of “bubble” that restricts how much housing could be provided in that neighborhood. De Blasio’s plan includes rezoning (called upzoning) a handful of neighborhoods so that developers can build taller buildings; in exchange for this right, they must, in turn, set aside a certain fraction of units for those in the lower income brackets. As the map below shows, large swaths of the city have rather extreme zoning limits. The map shows by zip code how much housing can be built, on average, per square foot of lot; this is called the Floor Area Ratio (FAR). A neighborhood with an average FAR value less than one, for example, means that builders can only be expected to construct one family house with ample backyards. 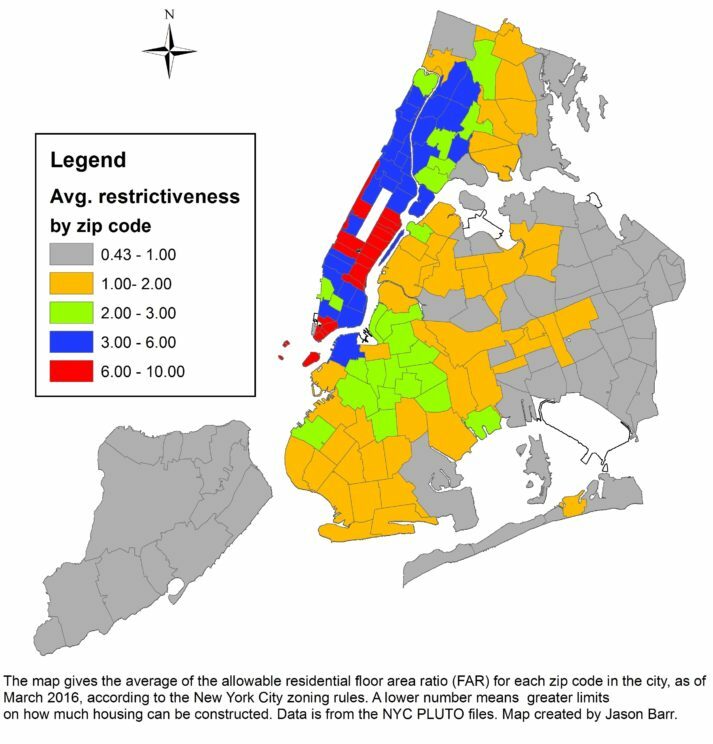 Relatively modest changes in the zoning restrictiveness across the entire city will likely have a much greater impact on housing affordability than adjustments in a few a selected neighborhoods, which residents are increasingly resenting as what they see as unfair treatment by the government. Zoning Restrictions by Jason M. Barr. Used with Permission. Given the high cost of construction (and demolition) and zoning restrictiveness, landlords will not tear down older structures, since they cannot replace them with more housing that would recoup the costs of providing it. The only meaningful way to incentivize more housing construction is to allow landlords the chance to earn an income from buildings that can accommodate more families. Once this happens, housing costs in the city will become more affordable, at all income brackets. In short, real affordability will emerge when government policies are designed to promote housing construction in all neighborhoods across the city, rather than simply focusing on a magic number. Featured image credit: New York Skyline by Mark Ittleman. CC-BY-2.0 via Flickr. Jason M. Barr is an associate professor of economics at Rutgers University, Newark. His areas of interests include urban economics, New York City history, and computational economics. He has published many articles in top peer-reviewed economics journals. He is one of the leading scholars on skyscraper economics. His research has been discussed widely in the media, including in the New York Times, The Economist, National Public Radio, and the New York Observer. He has taught economics at Rutgers University-Newark, Dartmouth College, and Columbia University. 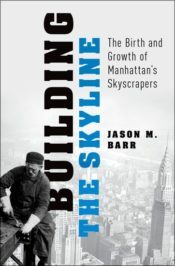 Jason is the author of Building the Skyline: The Birth and Growth of Manhattan’s Skyscrapers. Given the effectively zero percent vacancy rate and a functionally limitless number of people willing to come move here, of all levels of income, I think it’s nuts to claim that getting rid of rent stabilization will somehow cause prices to drop. Landlords want to maximize profits (they are the definition of rent-seekers). They will raise the price offered on every single apartment until there is one and only one person willing and able to pay that price. As individual apartments in any building become deregulated, this is exactly what happens. Boston got rid of rent regulation and everything went up across the board, even the previously market-rate places. There is no reason to think the same would not happen here. Plus there is the fact that people like living in pre-war buildings; that’s actually a draw! I live in one and I can tell you it’s much better than a new building. There have been myriad stories about the shoddiness of new construction in NYC, several “lux” buildings in brooklyn that were condemned within a few years of opening, etc. Old buildings have brick walls, taller ceilings, larger apartments, great old details, you name it. It’s a classic story of (restricted) supply and demand. Competition for rent-controlled apartments is always high — plenty of demand, but little new supply available. Removal of rent controls for some apartments might help to temper or even lower the aggregate cost of market-rate units, but this isn’t likely to promote much by way of affordable homeownership. Perhaps the only way to really incentivize builders to create affordable units is to devise a mechanism where the profit from building them is equivalent to that from building upscale units. If a builder could build a luxury project and realize a profit of X, or build a project aimed at more modest renters and realize a profit of Y, it would seem like the thing to do is to cover the difference between X and Y via bonding, lesser permitting costs, or other compensatory means. Some may complain that this is a transfer of taxpayer dollars to private interests, which it would be, but failing public-works housing projects ends up being directly paid for by taxpayers, and this might be a means to an end that adds affordable housing stock to the city.